The Ark of the Covenant rests in a crate next to the gold plates of Moroni and the dissected corpses of the Martian invaders. Frozen in ice you'll find the Jersey Devil, a Yeti, and a bacteria that can eat any metal – it just can't STOP. Growing in a hidden hydroponics facility is a plant with a fruit that tastes like steak, with enough nutrition in a single serving to sustain you for a week. The plates they serve it on in the cafeteria are made of a 100% biodegradable plastic that – while it's still fresh – can absorb the kinetic energy of a tank shell without even spilling your drink. The global power balance teeters on the brink of chaos. We touch too much too soon. We discover things we were never meant to comprehend: Relics created by the whim of mad genius, or aliens, or gods – or godlike DEMONS . 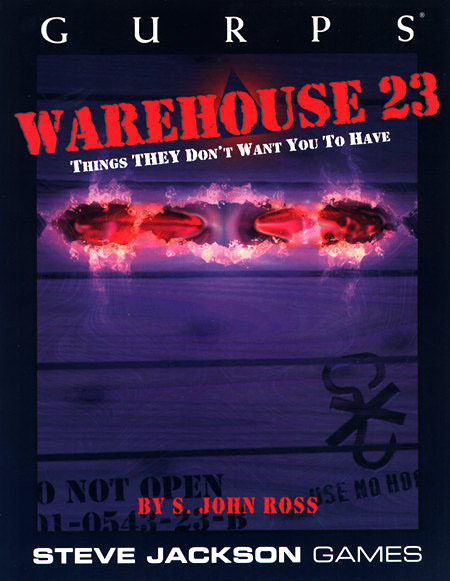 . . substances so potent that a handful could destroy our world, computers so subtle that no network is secure from their manipulation, sorceries dark enough to annihilate the purest soul. Somewhere, those with true Power have built a facility to imprison these forces . . . for proper study. For our own good. To insure order. Until THEY decide to unleash them. 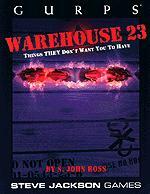 They know WE aren't yet ready for the contents of Warehouse 23. But are they? GURPS Technomancer – An alternate world in which magic and technology both work . . . all too well.